Susanna Hoffman wrote an article for the food magazine “Saveur” in 2010 stating that Greece is the fountainhead of European culture. The mysterious Minoans were among the first residents of Greece, arriving around 2700 B.C, writes Susanna. Besides finding wild grapes and making wine with them, they also discovered a bitter native berry they began to cure and press, and if you guessed the olive, you guessed correctly. The olive, and its oil, became the economic foundation of their civilization (Food History Of Greece – Saveur). We love barbecuing as the food always seems to have a special flavor. 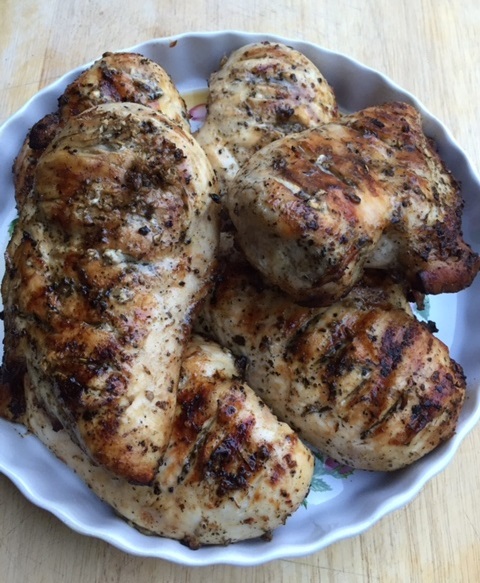 Our featured recipe is Greek Grilled Chicken, and before we bring out the recipe, we wanted to show you what we did to evenly and flavor-fully cook the chicken. We cut small slits crosswise on each chicken breast, being careful not to cut all the way through. Doing this helps the marinade penetrate the meat, which disperses the marinaded flavor throughout the meat and not just on the surface. It also helps the chicken cook evenly. We also did this method with roasted chicken breasts (Roasted Chicken With Chipotle Cinnamon Orange Glaze), and we have to say it always gives exceptional flavor to the meat, as well as the meat cooks evenly and retains its juices. Making those slits in the meat before marinading it, makes for awesome BBQ or roasted chicken. A Greek food expert on “About Food“, expresses Greek seasoning as the “quintessential” Greek flavors, which are olive oil, lemon, garlic, and oregano (About Food). With that said, our mouths are watering, so let’s bring out the recipe, and here is what you will need. In a glass measuring cup or an equivalent vessel, add all 7 ingredients and mix well. 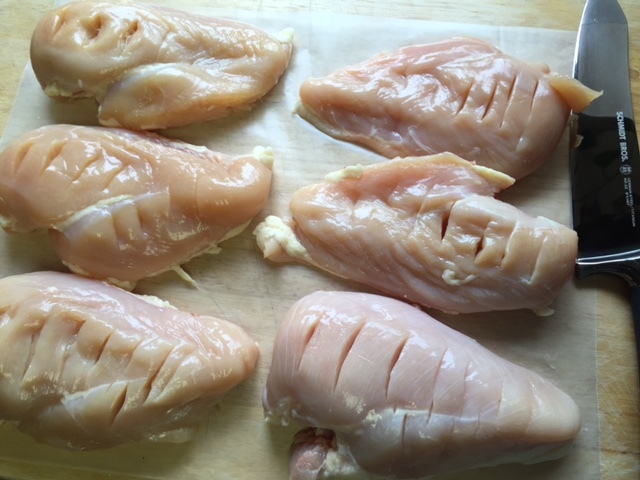 Using 6 to 8 chicken breasts, without the skin and bones, make those slits in the meat. I don’t like using plastic bags to marinate my food. In a large bowl, while layering the breasts, pour marinade over meat. 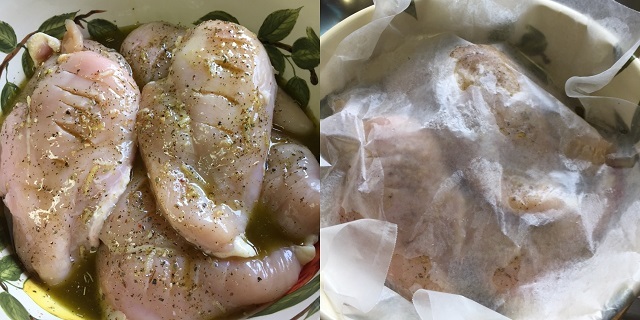 If you noted in our first image, the chicken breasts are sitting on a piece of wax paper, take it, and invert it over the chicken. Place bowl in the refrigerate for up to 3 hours. Heat your BBQ grill, and place the meat on the hot grill with flame turned down. Turn chicken about every 4 minutes. 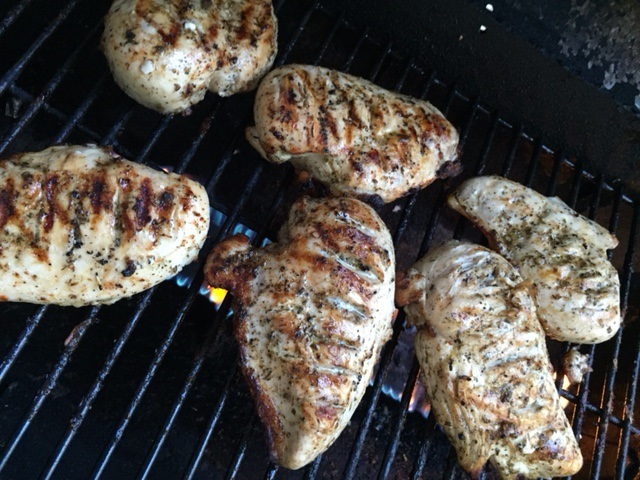 If you are using some thick chicken breasts, it will take about 25 minutes or so to cook the meat to 165 degrees internal meat temperature. 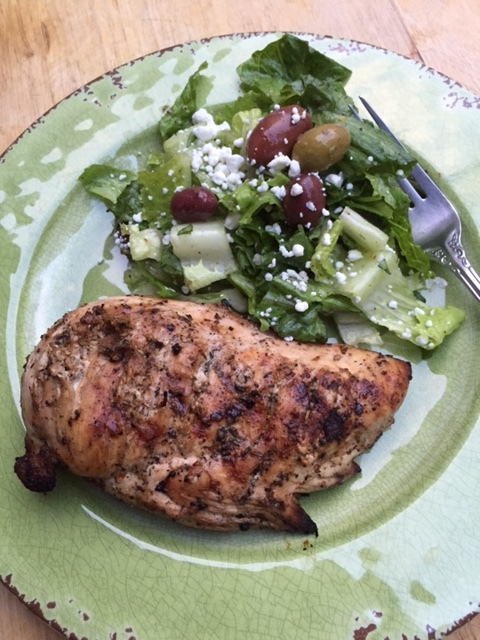 Plate and serve your Greek Grilled Chicken with a side salad or vegetable. Enjoy those “quintessential” Greek flavors!!! This entry was posted in BBQ, Chicken, Main Dish and tagged 2T, Adam, Aldi, Apple juice, Ashton-under-Lyne, Bay leaf, chicken breast, Clove, easy recipe, Flavor, Greece, Greek food, Greek seasoning, marinade, Mediterranean diet, Olive oil, Spain, Whole Foods Market. Bookmark the permalink. I have Greek seasoning and love to use it. I will definitely try this recipe – very appealing. Thanks Jovina!! I hope you enjoy the “quintessential” Greek flavors!!!! Yummy!!! I have been looking for ages for a greek chicken recipe and here it is!! Hey Thanks👍🏼😃 I hope you enjoy it.